Helsinki (AP) — With less than a year to go until the Olympics, figure skating star Evgenia Medvedeva looks unbeatable. On Friday, she didn’t just secure a second consecutive world title, she did it with a new world record and finished 15 points ahead of her closest rival. 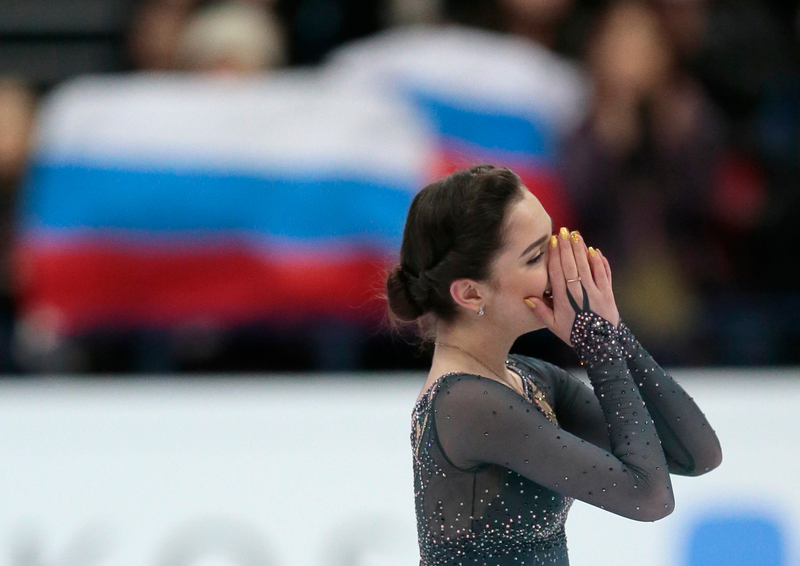 Medvedeva’s free program ended with an expression of despair as her character learned she lost a loved one. That quickly turned to a broad grin of satisfaction with another impeccable skate, and a new record score of 233.41 points. Medvedeva’s success in winning consecutive titles bucks a recent trend for Russian skating stars to burn out after a major championship success. Both the 2014 Olympic champion Adelina Sotnikova and 2015 world champion Elizaveta Tuktamysheva struggled to recapture the form that took them to their greatest successes. Medvedeva insists she doesn’t mind the spotlight that will come with being the favorite for the Pyeongchang Olympics — and the star of a Russian Olympic team which has faced repeated scandals. “I’ll feel that people support me and that will give me strength. I really hope for that,” she said, though she also said she tries “never to think about” the games. Canadian skaters left with silver and bronze as Kaetlyn Osmond took second place with 218.13 points, and Gabrielle Daleman was third with 213.52. They were Canada’s first women’s medalists since 2009. Osmond’s silver medal capped a remarkable comeback story after she broke her right leg badly in 2014, putting her skating career in jeopardy, while Daleman’s biggest struggle has been to convince herself she belongs among the world’s best in a breakout season for the teen. Russian Anna Pogorilaya finished her skate in tears after falling three times. She had been one point off third place following the short program, but plummeted to 13th. Russia, Canada, and the United States all secured the maximum three entries for the Pyeongchang Olympic women’s competition, but traditional skating powerhouse Japan earned only two as its top two skaters finished fifth and 11th. Earlier, Tessa Virtue and Scott Moir took the lead in the ice dance, chasing a third career title following a lengthy career break. The Canadians scored a record 82.43 points to a Prince medley, and beat their own short dance world record by almost two points. Virtue and Moir, who won the 2010 Olympics, skipped two seasons before returning to competition last year. They last competed at the worlds in 2013. Despite being unbeaten since their comeback, Moir said he and Virtue were nervous. “You’re feeling the butterflies and you’re trying to eat lunch and it won’t go down. You get out and you’re shaky, exhausted at the beginning of your program, but we’re happy with the skate,” he said. Two-time defending champions Gabriella Papadakis and Guillaume Cizeron of France were second with 76.89. Madison Hubbell and Zachary Donohue of the United States were third with 76.53. The free dance is on Saturday.